China continues to be one of the main engines of growth in the automotive industry. Safety and electromobility are big drivers in this industry. The ZF Group reinforces its strong position in the Chinese market with large investments in its development and production locations. ZF Editors Join us: For years, our editors have been writing articles on interesting topics from the industry and on ZF for the online magazine. He’s working late again, which means he’s already missed the last suburban rail train. But Xiaopu Xing isn’t bothered. He jumps onto one of the many rental bicycles and takes just five minutes to pedal from the ZF office in Shanghai to EVCARD – one of the city’s 2,800 electric car rental outlets. The 28-year old then drives 25 kilometers home in one of the compact electric cars produced by Chinese automaker Roewe. When he arrives, he plugs the car into a charging station near his apartment. “The acceleration is great, it’s good fun to drive,” says the ZF sales engineer, who works in the electric vehicle drive sector. ZF has invested in its Chinese development and production locations over the past five years. China continues to be one of the main engines of growth in the automotive industry. In particular, experts are expecting huge growth rates in new safety technologies and electromobility . China is already the world’s biggest market for electric vehicles – in 2016, sales rose by 53 percent to over 500,000 units, according to a recent study by Germany’s Center of Automotive Management (CAM). According to current plans, New Energy Vehicles (NEVs) should account for 40 percent of all newly registered vehicles in China by 2030 – equivalent to around 15 million new vehicles a year running on plug-in hybrid systems or all-electric motors. “There’s plenty of evidence that China will remain the leading market for e-mobility by some margin,” says Stefan Bratzel, the Director of CAM. This is no accident. Given Western manufacturers’ unbeatable lead in combustion engine and transmission technology, China’s manufacturers regard electric drives as the country’s best chance to draw level with today’s technological leaders.“Customers are interested in us because we’re on the spot, offer solutions for car and commercial vehicle applications, and cover the full range of modular hybrid and all-electric drive systems”, explains Xing. 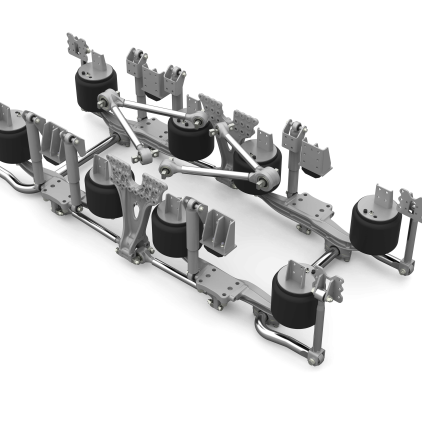 The air-sprung AIRTRAC rear axle system was developed especially for heavy trucks. The first Chinese customer for this innovation is the manufacturer Foton. ZF provides intelligent mechanical systems in the form of fast-reacting, integrated brake control systems such as the IBC (Integrated Brake Control) , complete with protective airbags, an active seatbelt system and electric power steering. Camera and radar systems for environment recognition and assistance functions such as the Electronic Stability Control (ESC) , the AEB system, emergency maneuvering assist and the integration approaches such as the X2Safe algorithm developed by ZF are all part and parcel of our mechanical portfolio. “Put it all together and it allows vehicles to see, think and act – the basis for both highly integrated safety and for autonomous driving,” adds Wu. To ensure the best possible level of protection, it is also crucial to determine how well the systems fit the relevant vehicle model. Thanks to its state-of-the-art test sled facility at the company’s Tech Center in Anting near Shanghai, ZF can perform crash tests that are specifically tailored to the Chinese marketplace. “For many years now, we've been working successfully with Chinese OEMs with regard to integrating our safety systems in the latest model generations,” says Wu. 2005 ZF founds the Corporate Headquarters for the Region of Asia-Pacific in Shanghai, along with an R&D center. 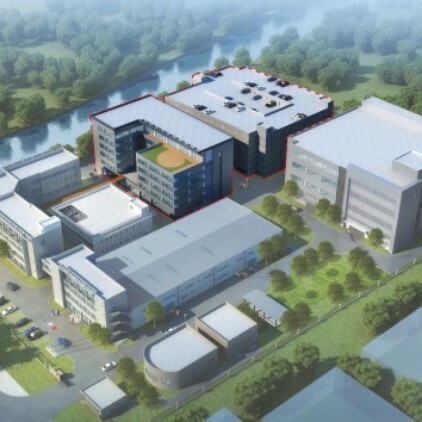 ZF has expanded its R&D center in Shanghai with additional laboratories, test benches and offices for this purpose. ZF Board Member Peter Lake talks about changing markets and customers, and about the company's localization strategy.